Fans of Fireman Sam toys will know that a brand new range of Fireman Sam figures have been released by UK toy maker Character Options. The figures are great to collect. They are colourful, wonderfully stylized and really bring the show to life. Originally, to collect all the Fireman Sam figures you needed to get some of the twinpacks or playsets and vehicles to get the exclusive figures. 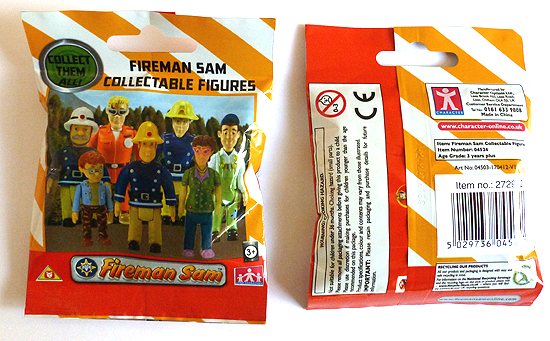 Many Fireman Sam figures are now available singly as well, packed in mystery foil bags. 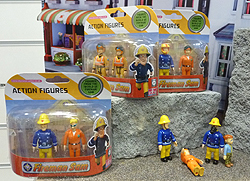 Plus, in 2014 Character released the Fireman Sam’s Figure Pack with Sam, Cridlington, Elvis, Norman, Dilys and Nurse Flood which gives collector’s a good start. The first wave of ‘Fireman Sam Collectable Figures’ by Character Options features Fireman Sam, Elvis, Station Officer Steele, Dilys, Mike Flood, Norman and Tom Thomas. Each figure comes with a collector’s checklist leaflet. Prior to that a range of two figure packs were released. You can find Fireman Sam in mask and oxygen gear with Fire Officer Steele or Fireman Sam in fire-fighter uniform with Tom Thomas in his pilot’s uniform. 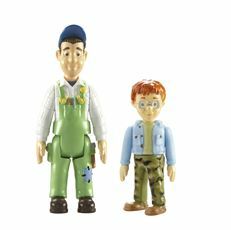 Also available is a twin Fireman Sam figure pack of Norman and Dilys. Plus a twinpack of Sam and Penny. Fireman Sam, our ‘hero next door’, is based at Pontypandy Fire Station. 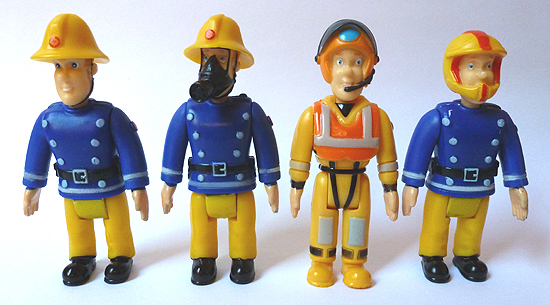 Several versions of the Fireman Sam figure can be found. Sam is under the ever-dutiful though oftentimes muddled command of Station Officer Steele. Fire Officer Basil Steele is the Chief of Pontypandy Fire Station. Tom Thomas is a mountain rescue worker from Australia with a station in the hills above Pontypandy. He is frequently found in his helicopter or mountain rescue vehicle. Tom Thomas is great pals with Fireman Sam. Dilys Price runs the local shop in Pontypandy and ‘naughty’ Norman Price is her son. Near-hysteria seems to be about par for Dilys, not surprising given the penchant for mischief of ever-troublesome Norman. Curiously, the Dilys Price figure is the hardest figure to track down, at the time of writing. The Norman figure can also be found in a twinpack with Pontypandy handyman Mike Flood. Mike Flood is the husband of Nurse Flood, and Mandy’s dad. The twinpack of Sam and Penny has the intrepid firefighters in their sea-going rescue gear ready to launch the Neptune Rescue Boat. Firefighter Penny Morris is the very valiant sole female firefighter in Pontypandy. Fireman Sam and Penny have their yellow high-vis suits and inflatable safety jackets plus helmets equipped with two-way radio. Fireman Sam in the red and yellow helmet is found with the Fireman Sam Quad Bike. The Elvis Cridlington figure is found in the Fireman’s Pole Accessory Pack. So far Character have released six different Fireman Sam figures; the standard release, with oxygen gear, in sea rescue gear, with his quad bike helmet, with fire axe and with megaphone. A full list of all the figures so far, regularly updated, and with links to detailed information and pictures can be found on our checklist page.